In Books & Reading, Jane Austen. Jane Austen is a classic, no doubt about it, but she’s gathered quite the cult following: normal fans don’t don Regency bonnets at a themed festival, bumper sticker their cars, or buy action figures. But perhaps the greatest proof is the never-ending stream of Jane Austen remakes and romantic comedies. Here are five favorites. In this 1995 movie, Jane Austen’s Emma is re-imagined for 1990s Beverly Hills, with high schooler Cher (Alicia Silverstone) standing in for Emma Woodhouse. The movie sticks awfully close to Austen’s plot: Cher is a devoted matchmaker (she sets up her teachers, she sets up her friends, she sets up new girl Harriet Smith, dubbed Tai in this Valley Girl setting). She’s also obsessed with fashion and dotes on her daddy. Nora Ephron’s 1998 remake of the 1940s classic Shop Around the Corner also incorporates major themes from Pride and Prejudice. Hanks and Ryan are quippy (and barbed) enough to make Elizabeth and Darcy proud, and the book itself makes it into several email messages and strategically appears in a key scene. The remake is better than the Jimmy Stewart/Margaret Sullavan original. Elizabeth Darcy is re-imagined as a thirtysomething single Brit in this 2001 hit, based on Helen Fielding’s book of the same name. This film is loosely based on Pride and Prejudice, though the love triangle (that pulls in Hugh Grant) hews awfully close to Austen’s story. Renée Zellweger stars as Bridget, and Colin Firth was asked to play Mark Darcy solely based on his appearance in the 1995 BBS edition of Pride and Prejudice (and specifically, for the lake scene). Serious Bridget Jones fans know Fielding’s much-anticipated new installment, Bridget Jones: Mad About the Boy, just came out on October 15. 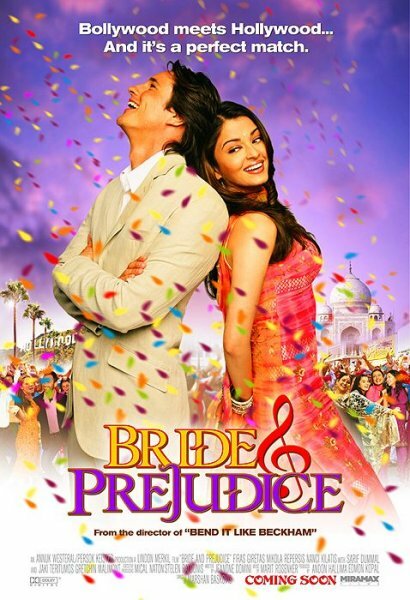 Pride and Prejudice becomes a Bollywood musical in this 2004 adaptation. Lizzie Bennett becomes Lalita Bakshirich, the second of four daughters in a country town in India, who falls–though not at first, of course–for the rich American hotel heir William Darcy. I put off watching this one for years because I thought it sounded silly. I’m sorry I did: it’s so much fun. The story unfolds four-ish minutes at a time, in one hundred YouTube installments. Proof of its success: its recent Kickstarter campaign raised nearly 800% of its stated goal. 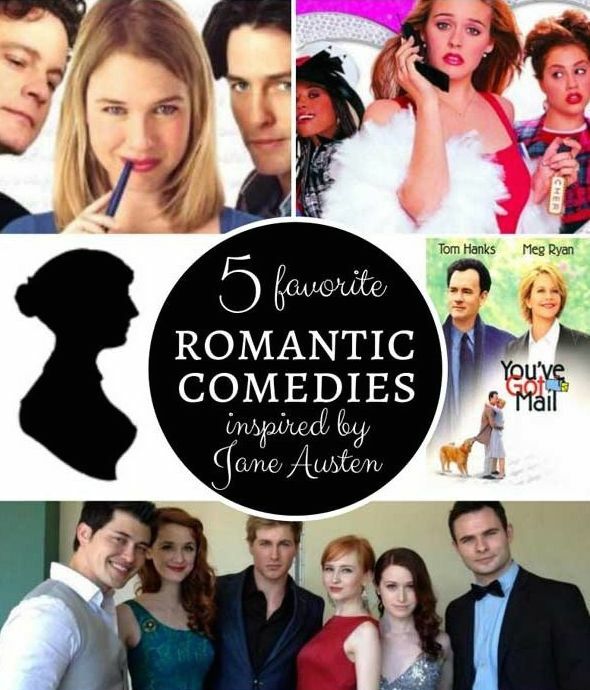 What’s your favorite Jane Austen-inspired rom com? Are there any good ones I didn’t include here? 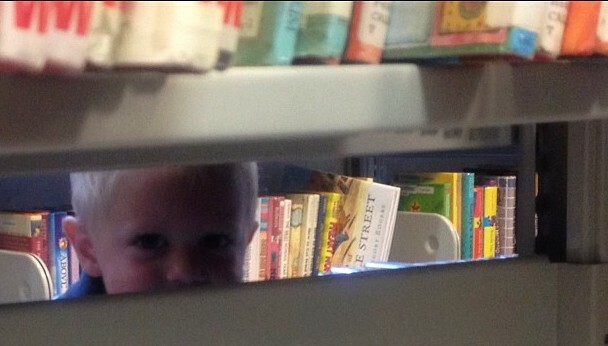 Previous: Loving (and leaving) the library in my own backyard. Bride & Prejudice is soooo good! I agree with the above comment. Bride and Prejudice has become one of our family favorites. We live in Central Asia which helps make it more fun for us. I must confess the only one of these I’ve seen is Bridget Jones’ Diary. 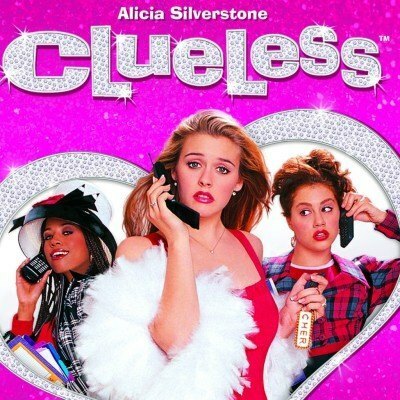 I should watch Clueless with my daughter (she’s 15) — sounds like our kind of movie. By the way I HAVE seen The Jane Austen Book Club (which I really enjoyed, much better than the book) and Lost in Austen (weird but kind of interesting!). I hated that book, too! I saw the movie before I knew there was a book. Loved the movie!! Then I saw some reviews of the book that convinced me it wasn’t worth reading 🙂 I would definitely recommend the movie though! Bride & Prejudice is above and beyond the best! My whole family loves it, well, except maybe my husband, but he does watch it with us! Anne, you know how much I love The Lizzie Bennet Diaries. We liked the others here too (except for Bridget Jones, never saw it). Bride and Prejudice has one of the best dance scenes ever, and certainly the best of any modernized Austen adaptation. There are a few of us Y chromosomed Austen fans out there, Jaimie! Clueless! Love it. 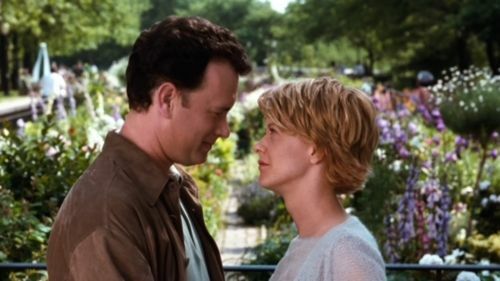 And You’ve Got Mail – my all-time fave. I love You’ve Got Mail but never realized it was Austen inspired. I agree w/ everyone re: Bride & Prejudice. It took me a while to get used to the Bollywood cheesiness but once I did . . . so much fun. The people who made the Lizzie Bennet Diaries are producing a series called Emma Approved. It just started, I think it looks promising. So glad you included the Lizzie Bennett Diaries. I love all the ones you mentioned, but that is my favorite!!! I never knew You’ve Got Mail had any Austen overtones! I’ll have to watch it again with this in mind. 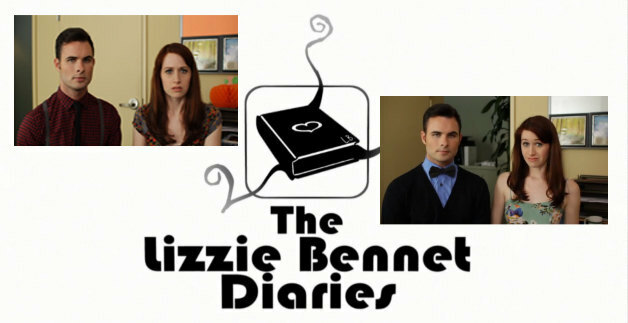 Love the Lizzie Bennet Diaries. What a great list. The only one I haven’t seen is The Lizzie Bennet Diaries. Bride and Prejudice is one of my favorite movies. It is absolutely hilarious! I saw it in the theater and had no preconceived ideas about what to expect which was awesome. You’ve Got Mail was one of two VHS I owned in college and I watched it at least once a month. I have most of it memorized and there are so many quotes appropriate for various situations. I also am obsessed with her apartment. On a side note, there is a musical version of the You’ve Got Mail/Shop Around the Corner “series” – In the Good Old Summertime with Judy Garland and Van Johnson from 1949. Clueless is the best! I really enjoyed Bride and Prejudice. You need to watch it soon! I just couldn’t get in to The Lizzie Bennett Diaries despite my best efforts. I am positive there’s another movie I’d want to recommend but I cannot come up with it for the life of me. I’ll let you know if I ever figure it out! You’ve Got Mail is my fave partly because I met my husband on the internet! I just watched it (a few times) recently while he was on a business trip. One of my best friends can practically quote it from memory. I’m pretty sure we used to check it out from the library on VHS. Is that possible? Hah. Love that it’s on Prime! I read The Secret Keeper last night. It was soooo good! I have not seen “Clueless” or “Bridget Jones’ Diary” (although with that cast, I have no idea WHY I haven’t seen it!!). The same dear friends who introduced me to “Pride and Prejudice” also introduced me to “Bride and Prejudice” and I LOVE it. You will too, especially being a Gilmore Girls fan; Alesis Bledel has a role in Bride and Prejudice). It stays wonderfully true to the essence of P&P and is hilarious to boot, plus has awesome song-and-dance numbers and is beautiful and colorful besides. I’ve loved “You’ve Got Mail” for years; “Sleepless in Seattle” has always been one of my mom’s favorite movies, so I grew up watching Meg Ryan and Tom Hanks. I’ve also seen “Shop Around the Corner,” but I agree, YGM is better. Alexis Bledel is in Bride and Prejudice?? I had NO idea. Glad I’m not the only one who thinks You’ve Got Mail is better than Shop Around the Corner. Anne, have you seen “Becoming Jane” with Anne Hathaway? I was just curious. IMO it was just okay. Apparently it’s not very historically accurate. I’ve checked it out of the library three times but have never seen it! I had no idea You’ve Got Mail was Austen inspired! It’s such a great movie. And Clueless…I love that one! Speaking of Austen, have you heard of Austenland? It’s a book written by Shannon Hale (one of my favorite authors) about a girl who is a huge Austen fan and spends her life savings to go to a Austen-themed resort, where they dress and act in character. The movie version of the book is in theaters now (not in all theaters, but going to more every week). The movie is SO good and completely hilarious. It makes fun of Austen fans, makes fun of Austen storylines, but contains an Austen-worthy storyline. I’m hoping that down the road, it can be considered a cult classic. It is definitely worthy of reaching that status! I thought Austenland the book was okay, but I haven’t seen the movie yet. I’m definitely planning on it–I love Keri Russell! Alright, if we are talking about Lizzie Bennet Diaries, I have to just put this here: http://www.youtube.com/playlist?list=PL_ePOdU-b3xcKOsj8aU2Tnztt6N9mEmur. Hank Green and company are now doing Emma in a series called Emma Approved! I’m really liking it so far! I agree that Emma isn’t the most likable at the moment but I’m hoping that as the episodes continue that she will warm up to the role and that we will see a huge character development like in the book. Either way, I think it is great to have a modern take on Austen. Even if the situations become outdated, the themes and experiences are eerily similar for women of all time. Have you seen “Lost in Austen”? It was a mini series that aired in the Uk about 5 years ago, and I think it’s on Netfilx now. It’s a twist on Pride and Prejudice where a modern day devotee of the book finds herself in the story (switching places with Elizabeth) and ends up almost messing things up and has to put things back together again. It’s fun to watch how all the intricacies of the storyline play out, as well as how they respond to a 21st century independent woman, even in Jane Austen’s female-empowered world. Love it. Lost in Austen was a fun take on P&P, Lacy. That might have been the best Mr. Bennet of all adaptations. I enjoyed “From Prada to Nada”, a remake of “Sense and Sensibility”. Have you seen Scents & Sensibility? I liked it. I’ve only seen one of these. Must rectify that. I’ve seen You’ve Got Mail, Clueless and Bridget Jones Diary. Loved them all (like others, I didn’t know YGM was Austen inspired!). Amazingly, I have never watched any film adaptations of Jane Austen’s books! Which Pride & Prejudice is the best one to watch? Definitely the BBC version. It’s about 6 hours of your life, but it’s so worth it! I really like 2005 (Keira Knightley) and 1996 (Ehle/Firth). 1996 is more true to the text (you can do that if you have SIX hours, although it doesn’t make the purists happy), but I like the attention 2005 draws to different aspects of the characters, and their imagery is amazing. Just pick one—and then make time to watch the other! I loved all of these, though it’s been so long since I’ve seen You’ve Got Mail I had no idea! Have you seen Austenland? Super dorky but I kinda love it. You’ve got three of my faves on that list, Anne: Clueless (best modern adaptation of any JA ever), The Lizzie Bennet Diaries (which a certain blogger introduced you to if I’m not mistaken) and Bride & Prejudice (love the wedding dance scene!). 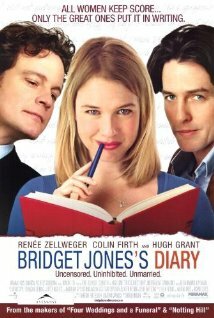 I never got around to Bridget Jones’s Diary, but I’ve seen You’ve Got Mail and liked it well enough. 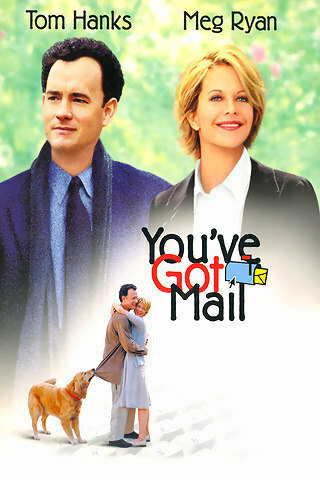 Late to the comments, but “You’ve Got Mail” is the all time favorite romantic movie for my me and my husband. We have watched it so many times on date night with take-out food or wine and munchies. Have not seen any of the other movies although several sound interesting. Thanks for this post, Anne! I love Clueless (for the story/acting/comedy but early Paul Rudd, too), and I love YGM. The P&P references make sense in hindsight! (Ever since I learned about intertextuality, I see it everywhere.) So, that makes Bride and Prejudice and LBD next! Seen it all & I agree from those above Bride & Prejudice is lovely & also my favorite among these 5 but I also enjoyed seeing The Lake House (references to Persuasion) & Aisha (Hindi version of Emma). I haven’t seen either The Lake House or Aisha. Thanks for the recommendations! I loved the lake house and it gives me my persuasion fix till they bring out a version worthy of the book. Takes a bit effort to follow the modern take on something worth waiting for but I love Sandra Bullock and Keanu Reeves in this, good sound track as well. I Have Found It, a Bollywood remake of Sense and Sensibility. Fun to watch. Yes, I love I Have Found It (Tamil name: Kandukondain Kandukondain in case you can’t find it under the English). Aishwarya Rai is Meenakshi/Marianne, and Tabu plays Sowmya/Elinor. The music is good, too (A.R. Rahman). I think I need to watch that again now. And don’t forget that the second Bridget Jones is based on Persuasion, although book-Bridget is much better than the movie. You’ve Got Mail, Clueless, and Bridget Jones are some of my favorites! Clueless is one of my favorite movies. I was 14 when it came out, so prime for soaking in all the glitz and humor. However, I didn’t realize until years later that it was based on a Jane Austen book and went out and started reading Emma. That’s what propelled me to start reading Austen, which just made Clueless more dear to me. I haven’t hear or seen some of the other ones. You’ve Got Mail is a movie I love to watch because, though not a Meg Ryan fan, I like how she and Tom Hanks play off each other. I haven’t seen it in a while…I might need to remedy that. A couple of other suggestions: BBC version of Persuasion, with Sally Hawkins, and Miss Austen Regrets, with Olivia Williams—beautiful, understated, moving/touching, thought-provoking, haunting, and even profound at times. Not lighthearted incarnations that most people associate with Jane Austen, but show another side of the author and are just as compelling. Have to check out Lizzie Bennet Diaries, so thank you for that. Wasn’t a fan of Bride & Prejudice for various reasons, but Clueless, Bridget Jone’s Diary, and You’ve Got Mail were spot on. I’m not sure it qualifies as directly inspired by Austen or a classic cult favorite (except by me), but French Kiss with Meg Ryan and Kevin Kline is definitely a comfort watch for me. Entertaining, funny, fluffy, gets better with subsequent watching, deceptively substantive, beautiful visuals, surprisingly excellent and unexpected casting/pairing and acting (okay, you can maybe quibble about Kline’s French accent). 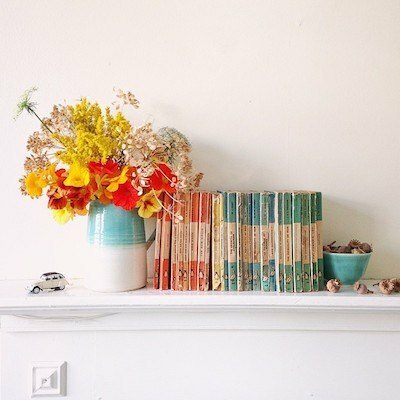 Pingback: Love Jane Austen? 10 More Books to Read! - Seriously, Sarah?Seriously, Sarah? Not a romantic comedy, but I loved Death Comes to Pemberley (streaming on Netflix) — the two leads are perfect as Mr. and Mrs. Darcy!! A wonderful adaptation of the P.D. James novel. I read the book but haven’t seen the series yet. Thanks for the reminder! I hope you broken down and watched Austenland. It was funny and romantic. You get lost between fantasy and reality. Keri Russell was perfect as Jane Hayes who was obsessed with Mr. Darcy. Jennifer Coolidge, of Legally Blonde and Two Broke Girls, was hilarious! JJ Feild from Northampton Abbey played the brooding Mr. Henry Nobley. By the time I was done watching it, I had a huge smile on my face! !